Team sync and synergy--here, there, and everywhere. Consolidation and team collaboration with a centralized channel of shared data, workflow, and communication with your business team. Keep colleagues in the loop, in real time, and enable their input and collaboration on-the-go from any device. As a Microsoft Gold Partner with extensive expertise in Microsoft SharePoint, we’ll help your organization increase productivity through enhanced collaboration software and tools. With our team collaboration solutions, we’ll reduce the internal email and paper clutter by delivering easily accessible content and automated workflow to your business community, with real-time team comments and participation. Along with Business Intelligence dashboards, Peters & Associates will work with you to automate business workflows and processes online, and enable a secure hub for team collaboration inside and outside of the organization. Plus, you control who gains access to what information. Streamline common business processes while reducing pressure on your human resources department. Powered by SharePoint. 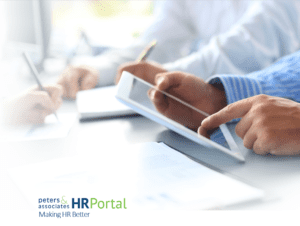 HR Portal is available anytime and anywhere. Peters & Associates is a recognized leader in the design, implementation and support of robust end-to-end collaboration solutions using Microsoft SharePoint—a leading collaboration platform. SharePoint is an incredibly flexible platform that can solve many different challenges facing your organization—and improve the efficiency of your IT department. Our SharePoint architects will work with you to design a solution to meet your specific goals, implement that solution for you, and work with your team on user training and adoption planning.